A trekking bike of the upper middle class for frequent riders who value sportiness and a good price/performance ratio. 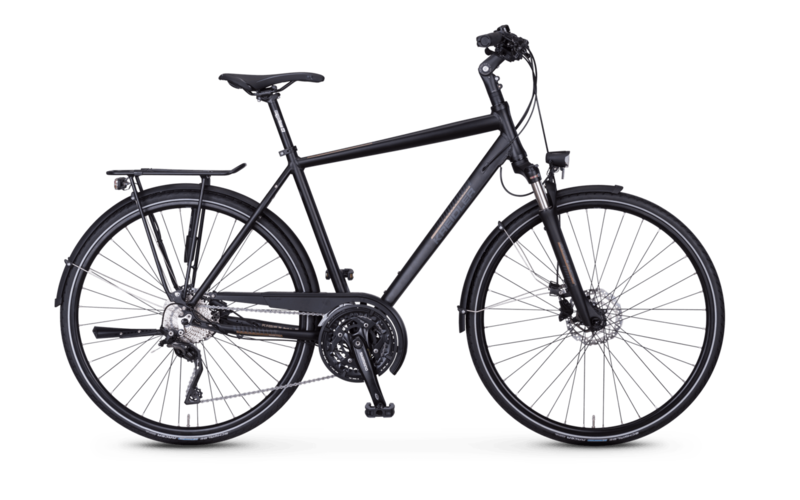 The aluminium frame, painted in matte dark grey, offers high stiffness and the best riding characteristics despite its low weight - both on the road as well as off-road. This trekking bike is available in both men's and women's versions. The proven Shimano Deore XT cassette does its job precisely and reliably and the trekking bike has a powerful braking system.with a Shimano hydraulic disc brake. The handlebar grips from Herrmans as well as the saddle from Velo stand for quality and performance suitable for everyday use as well as the proven Racktime luggage rack for this trekking bike model. The fast Marathon Racer tyres from Schwalbe offer low rolling resistance and good puncture protection.